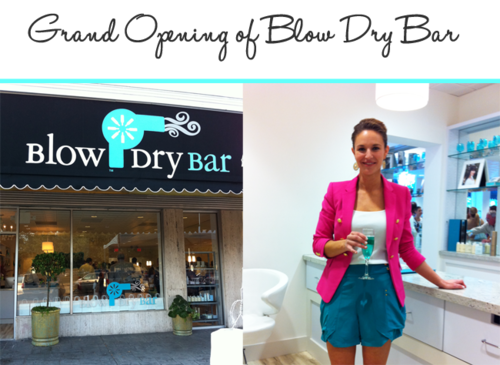 Last night I attended the grand opening of the new Blow Dry Bar in Houston with a friend and had a marvelous time! Sipping on wine and blue-tinted champagne, we were able to tour the cute facility, speak with the owner and several hairdressers, and take home a few goodies! Centrally located on Westheimer in between Kirby and River Oaks Blvd, Blow Dry Bar is an attractive boutique salon specializing in blowouts and only a few other unique treatments. Never again will you have to fret over your original hairdresser being to busy with other cuts and colors – you now have a one-stop-shop for blowouts for any and every occasion! While speaking to the owner Rebecca (pictured above in a FAB hot pink blazer), we found out a few fun tid-bits for you: upon every visit to Blow Dry Bar for an appointment, you receive a free glass of champagne or wine; they play fun movies like Moulin Rouge during the day for their customers, and they carry amazing hair care lines such as Kevin Murphy. At $35 a blow out, you truly have no excuse to avoid this hair-heavenly hot spot. Click here to find out more about Blow Dry Bar and to book your appointment!